The repair bill for Halifax Borough Market will be over £3.5 million as Calderdale Council fixes its leaky roof and its doors due to health and safety fears. The Council has already allocated £225,000 for the first phase of a programme of works to prevent leaks into the Market Hall. Work is expected to commence on site in February 2017 and take five months to complete. 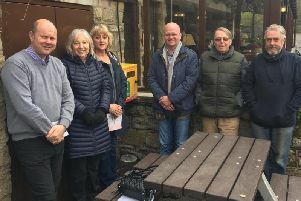 However, Calderdale Council’s Markets Manager, John Walker said there will be disruption to tenants and users of the market and further funding will be needed to meet the estimated costs of the remining repairs . “A scaffolding design has been procured for the whole market which can be utilised during the programme of works. “There is potential for the works to commence November/December 2016, however the works could impact on the Christmas Shoppers and trade, therefore recommendations are to commence works in the New Year so as to cause minimal disruption to all stakeholders. “There will however be some disruption to the tenants and users due to the internal scaffolding which is required to enable the works to be completed. Whilst the scaffolding is in place it is proposed that the upper area will be cleaned and repainted which will also impact upon the area of roof that can be repaired. The proposal also includes the provision of a man safe system to enable safer access to the external roof area for future inspection and a CCTV camera is provided to provide additional security of the roof area. Funding to refurbish and replace four gates to the Borough Market that are a considerable Health and Safety concern due to difficulties in opening and closing has also been approved by the Council. The gates will be removed from site and a different opening mechanism which will installed to enable the doors to be easily handled. Temporary shutters will be installed to secure the building whilst the gates are off site. The four initial gates to be refurbished are Albion Street, Albany Arcade (off Southgate), the middle gate on the Southgate elevation and the sliding gates on Market Arcade.